GLENDALE, Ariz. (AP) The first period was one of Chicago’s best all season, but it gave way to a penalty-ridden second. Through it all, the Blackhawks found a cure for their ailing power play and stopped a three-game slide. Patrick Kane had a goal and an assist, Duncan Keith added two assists and the Blackhawks defeated the Arizona Coyotes 4-3 on Thursday night. Chicago led twice by three goals but yielded three in the second period and had to hold on. Ryan Hartman, Marian Hossa and Artemi Panarin also scored for the Blackhawks. The Blackhawks scored twice in 72 seconds during the first period, their initial goal coming 15 seconds into a power play. Kane’s left-handed shot pinged off the crossbar and down into the cage at 8:44. Hartman made it 2-0 at the 9:56 mark, his long shot zipping through several players in front and past Arizona goalie Mike Smith. Smith finished with 22 saves, but several kept the Coyotes in the game. 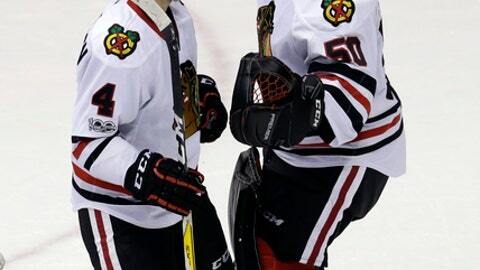 Corey Crawford turned aside 24 shots for Chicago. The Blackhawks, who entered with one goal on their last 20 power plays, scored on the man advantage again at 14:15. Hossa, stopped by Smith on a breakaway early in the game, zoomed past defender Alex Goligoski and fired in on the move for a 3-0 lead. Hossa’s 19 goals lead the Blackhawks this season. Many in the sellout crowd of 17,125 wore Blackhawks jerseys. Coyotes fans finally got their chance to cheer when defenseman Luke Schenn and Chicago’s Andrew Desjardins threw punches late in the period. Schenn got the better of the fight, leaving Desjardins bloodied, but took the worst of the punishment as far as penalty minutes. Schenn was handed seven minutes for fighting and instigating, and a 10-minute misconduct. Two quick penalties nine seconds apart to start the second period gave the Coyotes a 5-on-3 power play, and Ekman-Larsson scored off a pass from Radim Vrbata to cut the Blackhawks’ lead to 3-1. Arizona has scored in the second period of six straight games. Panarin made it 4-1 at 5:24 with his 18th goal of the season. Kane helped set it up when he fought for a loose puck, and was credited with an assist. The Coyotes benefited from 10 second-period minutes in penalties against the Blackhawks and made it 4-2 at 14:24 when Dvorak got a deflection of Shane Doan’s shot past Crawford. Perlini scored at 15:51 to cut the margin to one, and the Blackhawks had to kill what started as a 5-on-3 disadvantage in the closing minutes of the period. Crawford did the splits to block a try from Alex Burmistrov during that Coyotes power play. ”There’s lots of try there. I’d just like to see our execution a little better, a little less thinking about the game and a little more doing in the game early,” Coyotes coach Dave Tippett said. Arizona pulled Smith for an extra attacker with 1:25 to play, but couldn’t come up with a tying goal. ”I liked how we stabilized the game in the third period,” Quenneville said. NOTES: The Blackhawks are 14-3-4 in their last 21 games against Arizona, and 9-2-1 on the road. … Chicago served three delay-of-game penalties in the second period. … Smith passed Bob Essensa for most saves in franchise history. Smith needed 14 to surpass Essensa and has 8,064. … Coyotes forward Max Domi returned from a broken hand. Domi, out since Dec. 9, needed surgery and missed 23 games. ”It’s going to take him some games to get up to speed,” Tippett said. Blackhawks: At the Dallas Stars on Saturday, the third stop on a six-game road swing. It’s the team’s second-longest trip this season. Coyotes: At the San Jose Sharks on Saturday before returning home for the next two games.